The following are common causes of sewer backups and tips on preventing it. Rainfall: Heavy rainfall can inundate public sewer systems with large amounts of groundwater and storm water going into the sewer lines. Sewer lines get too full, too fast, and are incapable of handling overflow, resulting in backup. Tree roots: Roots grow toward breaks or cracks in sewer lines in search of water. Inside the pipe, roots form balls that clog the sewer line. As trees or shrubs grow, the roots expand and can cause blockages in the sewer line. Grease: When hot grease cools it attaches to the walls of sewer pipe causing other objects flowing down the drain to stick to the grease. Eventually a blockage happens. Toilet paper and foreign objects: When paper products (toilet paper, Kleenex, paper towel, disposable cloth diapers, feminine products, etc.) are flushed down the toilet, they can get stuck when they meet a bend in the sewer line. Waste then sticks to the object, resulting in a blockage and eventually a backup. Install backflow prevention valves: These are designed to block the sewer line temporarily and prevent sewage backflows. Consult a plumber first, as the type will depend on your plumbing. Dispose of grease properly: Do not pour down a sink drain. Use empty coffee cans, milk cartons or other heat resistant containers. Allow the grease to harden and then put the container in the garbage. Dispose of paper product properly: Do not flush Kleenex, paper towels, disposable cloth/diapers, feminine products and other small objects down the toilet as they do not break down quickly and create blockages. Plant trees away from sewer lines: A home or Condominium complex may have older trees and shrubs which are seeking moisture from the sewer lines. Hire a plumber or a root removal specialist to remove roots and repair breaks in the sewer line. Ensure proper drainage: This is key in preventing flooding. Ensure eaves troughs are not blocked and downspouts drain water away from the property. Ensure the grade around the foundation of your property does not slope inward. It should slope outward to ensure rain water flows away from and not into the foundation. 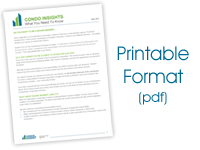 It is a challenging time in the Condominium Insurance market right now. Water and sewer backup claims have had an overwhelming impact on the market. Insurers have paid out more in claims than they have received in premiums. We have seen consistent rate and deductible increases for the last five years. “Act of God” claims such as wind and hail are now being reviewed and are affecting rates and deductibles. Risk management and prevention are more important than ever, in order for Boards to maintain economical premiums and deductibles.